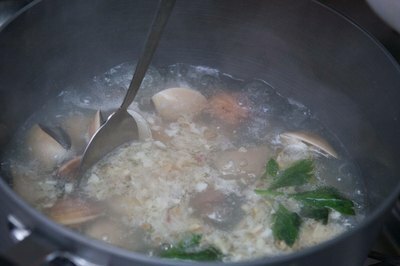 Steaming clams in a light, aromatic broth retains all the sweet, briny juices released by the shellfish during cooking, and requires very little culinary expertise once the clams are in the pot. As with any shellfish, however, there are no shortcuts during the preparation stage, because it takes only one bad clam to ruin a batch. Choose small soft-shell clams, helpfully called steamers, or hard-shell littlenecks, which are sweet and tender. 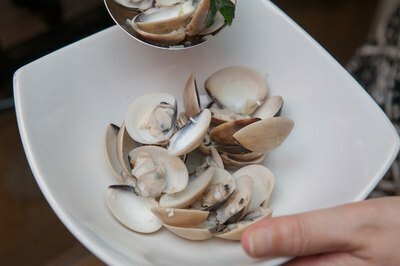 The larger clams such as quahogs are typically too tough and won’t absorb flavors as readily, and are better used in chowders. 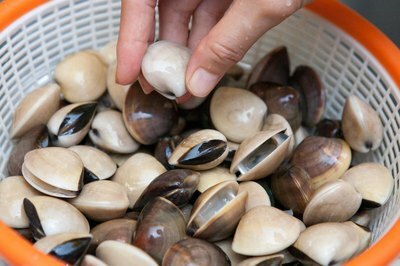 Soak the clams in a bowl of salt water overnight, or at least for two hours, to encourage them to expel their sand. Farm-raised clams are usually cleaned and rinsed, but wild clams will need thorough soaking. In either case, use a cup of kosher or sea salt per 3 quarts of water. Both iodized salt and fresh water will kill the clams. 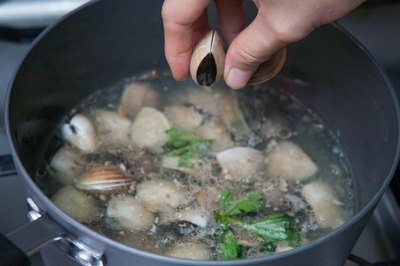 Some cooks add cornmeal or black pepper to the water to stimulate the clams. 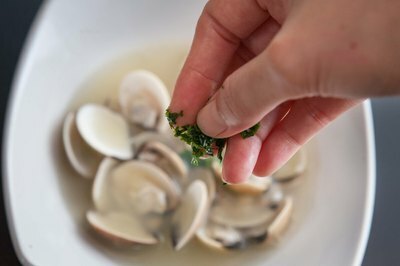 Scrub each clam with a soft brush under cold running water to remove any residual grit. Tap each clam on the kitchen counter. At this stage, the clams are still alive. Those that don’t close up, or where the protruding siphon doesn’t recoil when touched, are probably dead and can be discarded. 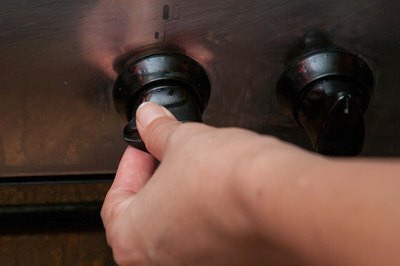 Melt a knob of unsalted butter, or heat a slug of olive oil, in a large pot and saute chopped onion or shallots, and garlic. Add 2 cups of white wine and herbs such as thyme, tarragon, cilantro, marjoram or parsley. Bring to a simmer, drop in the clams, cover and turn the heat to high. Reduce the heat once steam starts to escape. 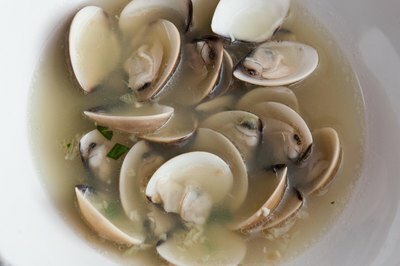 Shake the pot and stir the clams with a large spoon after 5 minutes to evenly distribute the broth. Continue steaming until all the clams have opened, typically between 5 to 7 minutes. Monitor the clams regularly, as overcooked clams are tough and disappointing. 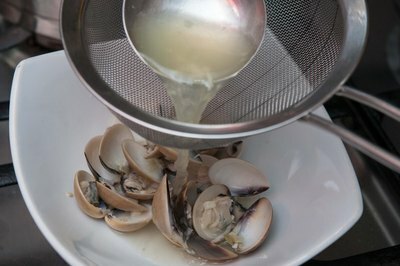 Transfer the clams to a large serving bowl with a slotted spoon. Pour the remaining broth through a fine sieve into a saucepan to remove any remaining grit. Either pour the broth directly over the clams, or whisk in cream and unsalted butter for a more unctuous broth, or experiment with chili flakes, curry powder or chopped lemongrass for an Asian-themed broth, using coconut milk instead of cream. Ladle the broth over the cooked clams and serve, garnished with fine-chopped parsley.